Life continues to amaze us with wonderful moments that are full of love: meeting people who never give up, even if the obstacles are great, and overcome conditions that are so dire such as living without feeling half your body. In 2017, Carlos Astudillo Tudela was diagnosed with brain cancer. Doctors did not give him more than three months to live. But after a delicate operation, Carlos used art and his passion for painting as therapy. After a year, he organised his first Painting Exhibition, where he presented 70 works. He had to start from scratch, he painted a third of the artworks with his left hand, the other half of his body is numb, as a result of brain cancer. Carlos’ artworks reflect his joy, love of life and his newfound strength. “I am never going to give up”, he told us excitedly at the opening of his show, surrounded by many friends. Carlos Astudillo Tudela, arrived in Australia in 1984. Had he stayed in Chile, he would have had to join the Carabineros. His father was Major of that association and wanted to enroll him as well as his other siblings; but he did not want that for his life and already had strong artistic inclinations, specifically painting. Before leaving his country, he met muralists at the Brigada Ramona Parra, with whom he became involved and who have kept him motivated in his artistic life until today. In 1995, Carlos met the love of his life, Elizabeth Valenzuela, who lived in Brisbane, on one of his trips to that city, but he would not see her until many months later, when the Chilean group Illapu performed at the Opera House in Sydney, where Carlos worked. “I walked in the room, and I saw those beautiful eyes that I could not forget, I was not sure, but as I got closer, I had no doubts, it was her, and I greeted her with a shy kiss on the cheek”. “We started talking quickly, she told me she had traveled from Brisbane for that concert, a gift for her birthday which was the next day. She was staying one night in a Hostel in Glebe and had to return to her city. It was a brief but unforgettable conversation. I had to leave her for a while, as I was working. When I came back, I felt sorry that she had left”, Carlos tells us very excited. “The next day I took my bike and went to Glebe, I had to find her no matter what. I went from hostel to hostel looking for her. After an hour I still had not found her, but I continued without hesitation, it was her birthday, I had to find her, and I could not let her go without telling her my feelings”. “When I started to feel tired and a little distressed, I entered one hostel and in a room watching television, I saw her, I told her I could not let her go without handing her a red paper rose, that I made the night before”. Elizabeth and Carlos had two children: Benjamin and Fernando and Carlos already had a son Robert, from his first marriage. In 1998, Carlos became a teacher of Visual Arts, and later completed his Graphic Design degree. That same year, he applied to work as a professor in his field, teaching disabled students, at the Miroma Center, in Vaucluse. 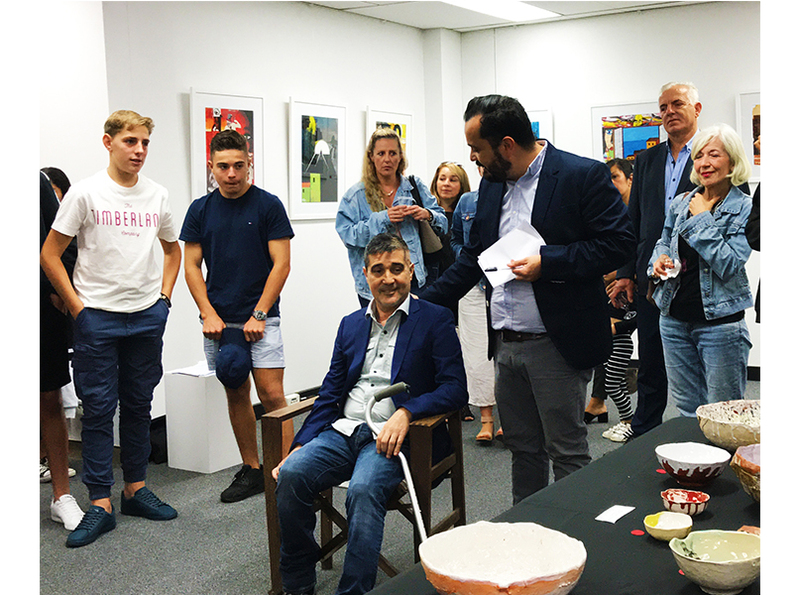 During those years, Carlos Astudillo did a lot of work for the Chilean community, mainly in the Eastern part of Sydney, for the Transandinos Club and others, he did it anonymously, the community did not know who was behind those works. In Ceo-Chile he had an outstanding participation and earned the respect and affection of all its members. “At Miroma, I was happy, I always made jokes and organised very colorful and cheerful activities; my motivation could not be greater as I was working with different children and young people, all of them very intelligent with physical and mental conditions, I gave everything for them, my commitment was total “. “I always told them to live with what they have, just as they are, to enjoy themselves, I treated them just like my children. I used to organise festivals according to the seasons of the year. In 2008 I presented an artwork, with all the children and the support of their parents, about the “Trilla” of the Chilean countryside”. All this, suddenly seemed to collapse, when Carlos found out he had brain cancer. He barely noticed it at first because there was no pain, it only manifested itselft in his movements and as half of his body began to feel numb. From that blow, Carlos’ life changed completely, all his energy and capacity was focused on his recovery and on fighting until the end. His wife Elizabeth, his children, and close friends supported him. “Today with more strength than ever I remember the advice of my mother, when she told me that in life truth is fundamental, always be transparent, be you, as you are, and fight to the end, never give up, never surrender”, commented Carlos. These artworks by Carlos are the product of his love of life, of his desire to remain standing and never give up. 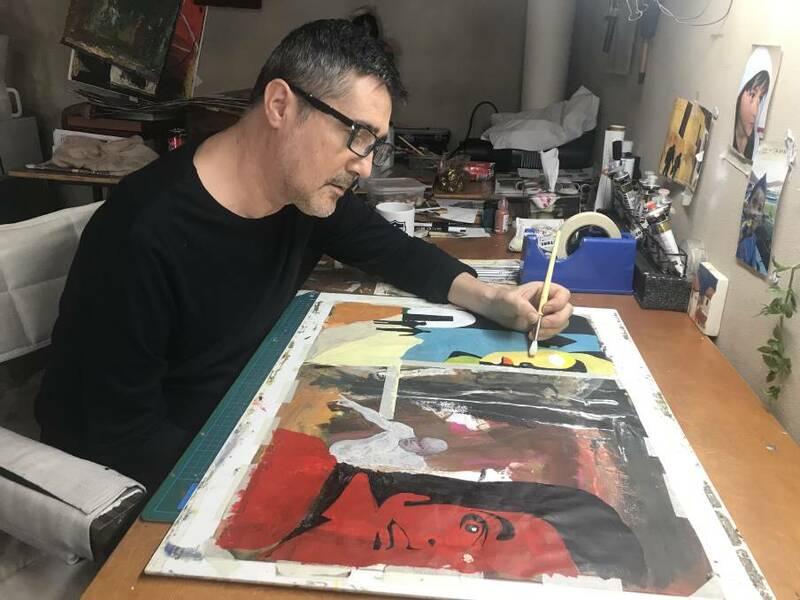 On March 31, 2019, he presented a new collection of paintings. Carlos Astudillo is role model for healthy people who do not make the best of their lives. “If it had not been for the painting, maybe I would not be here,” Carlos concluded excitedly. Article published in the Chilean newspaper Extra Informativo.